We like to think that science fiction has no limits. We love to believe that science fiction writers can imagine anything. But is that true? Reading your first few hundred science fiction stories, it does feel like the genre has unlimited avenues of exploration. However, after a lifetime of reading, over a thousand science fiction novels, and countless science fiction short stories, I’ve started feeling the genre is limited, and limited patterns are emerging. Even if there’s the potential for an infinite number of science fiction stories, there’s always the limitation of demarcation. We can divide things into what is science fiction, and what is not science fiction. What if we classified science fictional ideas like biological classification where science fiction would be compared to how we classify life. What would be the domain, kingdom, phylum, class, order, family, genus and species of science fictional ideas? 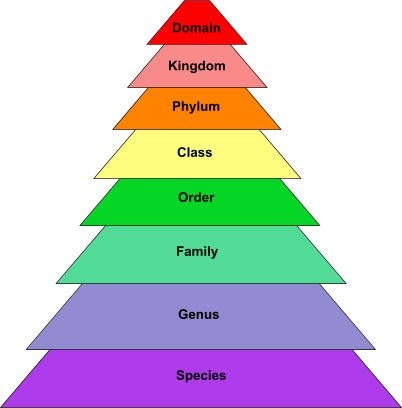 How would we organize novels into a hierarchy? Has science fictional ideas evolved out of each other to present an evolutionary taxonomy? Or are there other structures that we can all agree on? I’m just opening this idea up for discussion and will present a test classification for consideration. I’d like to see other classification systems suggested, and amendments to mine. So post links and suggestions in the comments section. For instance, Wikipedia offers two classifications: lists and themes. Other ideas can be found in their outline of science fiction. I wanted to create the smallest number of domains possible, and I was hoping to find a single highly descriptive word for each. I flubbed on “Created Beings.” I’m not really fond of “Humanity” either. My system mainly thinks of science fiction as stories about the future – future Earth, future humans, meeting aliens, creating new life forms, and traveling through the universe. Most of the main themes of science fiction would be equal to biological kingdoms – robots, alien invasions, interplanetary travel, post-humans, etc. Making the classification of science fiction be a perfect analogy to the biological classification of life would be a kluge, but it would be neat if we could map specific novels to be the equivalent of a species. If we could come up with a successful classification system it should be possible to select any science fiction novel or short story and put it into the structure – assuming we could classify SF stories as being about one topic. Science fiction novels are usually about many ideas. For example. The Naked Sun by Isaac Asimov. It could be classified under robots or galactic empires. However, it’s mostly about robots. Then again, some people might claim it’s mostly about agoraphobia and space colonies. And where would we put such a bizarre novel as Stranger in a Strange Land by Robert A. Heinlein? Under my system I’d file it under Humanity, Mind and Philosophy, although Religion might work too. If you wrote a novel about how intelligent robots create an Earthly utopia, would it be classified under Earth or Created Beings? There are animals that give biologists trouble when classifying, so we should expect problem novels too. On the other hand, we could think of a different way of looking at classification. Think of classifying books for library card catalog systems. These systems allow for multiple subject entries, but even in libraries, books are shelved under single subject groups. And I tend to think most writers ultimately think of their books as having a major theme. Classifying science fictional ideas is an idle amusement, yet it’s a revealing way to think about science fiction. A way to give a big picture overview of the genre. Like having the mental ability to instantly distinguish between cats and dogs, such a classification system would define science fiction. For example, I would never file traditional vampire and werewolves stories into my classification of science fiction. Even though many people casually dump stories of the undead into the genre because they think science fiction is a dumping ground for anything weird, I believe we need to think of the genre in more precise terms. We can also think of classifying fiction in general, so that fiction is the highest level, and the genres – literary, mystery, western, science fiction, romance, etc. – are the domains. This would make Science Fiction one branch off of Fiction. But if genre is Kingdom, do we need five layers of classification between it and the specific work which would be the Species? Is Fiction, Genre, Theme, Work enough? That makes me think of using Fiction, Genre, Theme, Time, Setting, Topic, Work. That way The Naked Sun would be classified as Fiction, Science Fiction, Robots, Future, Colony World, Conflicting Cultures, The Naked Sun. 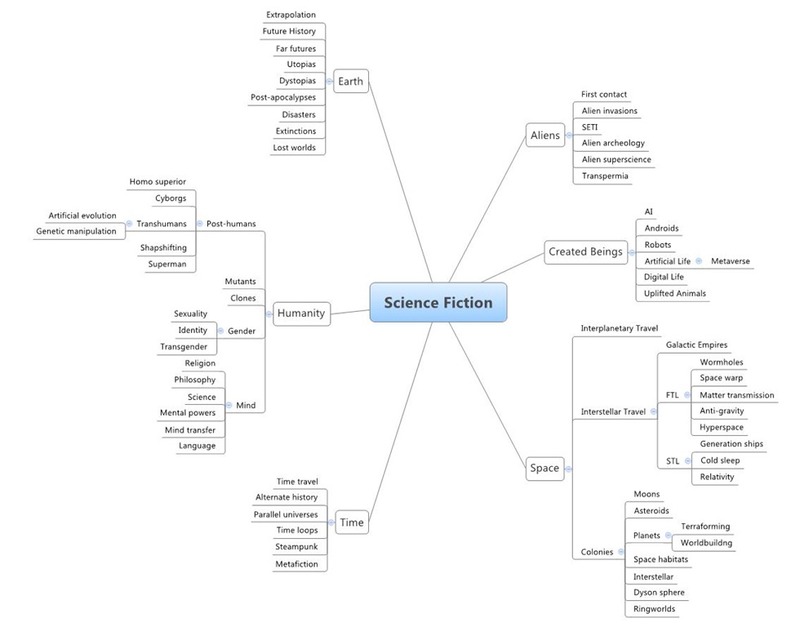 Many themes from classifying general fiction can be applied to any of the specific themes of science fiction. Thus you could add romance or war to almost any of my SF categories. As you can see, this could lead to all kinds of possibilities. A classification system really helped understand the organization of biological life. Would such a classification system help in the understanding of fiction? I’m not even sure about a definition of “science fiction” anymore – it used to be outer space adventures and futurist scenarios with a distinct emphasis on science and the results to humanity (ethical dilemmas). But now the futuristic part might be only 10 years away and the science includes the social sciences. Connie Willis writes historical fiction wrapped in a frame of time-travel with no particular emphasis on the science of anything. Yes, that’s true. Some writers have come up with science fictional reasons for vampires and zombies. It would still be filed under Humanity – maybe under Mutants. Or maybe just add on the same level, Monsters. It’s articles like this that keep me coming back to your site. People thinking about writing science fiction might be greatly aided in having your basic chart and just looking around and see what they might be able to add. I think there are many writers that don’t like to be labelled and will deliberately write stories that are difficult to categorize. Without your handy dandy classification scheme already there are authors who write interstitial fiction or fiction between genres. I have coined a term for a type of time travel on my blog ( larryrusswurm.com ),called “ignorant time travel”. That might add a branch to your Time theme. Rip Van Winkle is the forerunner of this branch. Basically when sleep, hibernation, suspended animation, corpsickles – er- cryogenics and time dilation are used to jump to the future the protaganist is using ignorant time travel. Of course you can only jump forward with this. Thoughts? For instance if there already exists a classification for this please tell me. Good point Larry. The Door Into Summer by Heinlein is one of my favorite books. He travels forward in time with cold sleep. And he travels back in time with a time machine. Generally this type of time travel is cold sleep or suspended animation. I’ll add them to my chart for version 2.0. I think mapping the territory will help even those writers who want to write something off the chart. I loved this post, I never looked at science fiction this way before. Thanks Bookgirl. Science fiction has always been notorious to define. I’ve attempted many myself. Using this visual tool is working out pretty well I think. And I’m already working on ideas for the next version of the chart. Special Collections 2(1/2): 151-170. Fall/Winter 1982. St. Vital, Manitoba: Canadian Science Fiction Association, 1952. 52 p.
in: Speer, Jack. Fancestral Voices, ed. by Fred Lerner. Framingham, MA: NESFA Press, 2004. p. 23-35. Metuchen, NJ: Scarecrow, 1994. 365pp. Acolyte 4(1): 3-13. Winter 1946. (No. 13) Also in: Speer, Jack. Fancestral Voices, ed. by Fred Lerner. Framingham, MA: NESFA Press, 2004. p. 19-21.
in: Speer, Jack. Fancestral Voices, ed. by Fred Lerner. Framingham, MA: NESFA Press, 2004. p. 35-40. Fancestral Voices by Jack Speer sounds interesting. It took me a while to research what it was. I’ll see if I can track down a copy. Thanks! I left out Everett Bleiler’s Science Fiction: the Early Years and Science Fiction: the Gernsback years. Each has extensive lists of topical subjects in the back. Great work! Your post sort of reminds me of the post “FLOWCHART: Navigating NPR’s Top 100 Science Fiction and Fantasy Books” on SF Signal’s site. Someone, it may have been John J. Pierce or Norman Spinrad, said science fiction “moves in clades”. I wonder if it would be possible to do a sort of cladistics on science fiction. Such a chart would plot the history and types of science fiction. However, you still have the problem about what to do with cross-genres. Literary genres probably swap DNA as readily as bacteria species. This is a really cool post. I don’t read much science fiction but a few days ago I got stumped when I tried to classify my fantasy novels. I had downloaded Book Collector (http://www.collectorz.com/book/) for organizing my books and I didn’t know how far I should go in classifying them. I agree that “fiction” should be the highest domain and all genres fall under it. That’s how I’ve organized my system thus far but I wonder if I should also include the themes and other elements unique to the stories. How do you like Collectorz? I keep thinking about organizing my books. I’ve tried several systems, and even thought of writing my own. So far now book database does everything I want. Oh I love it so far. They have a free trial that permits you to download the database and list up to 100 books. It allows you to go as in depth as you want to organize your books and also presents stats in the form of graphs, which I really like. You can upload the books either by scanning the ISBN or typing it in. I mostly like it for the visuals–book covers, graphs, etc. I was using a simple Excel doc before. Collecterz makes it easier to keep track of the books. I am a PhD Student interested in SF and I was wondering whether I could use your classification in my thesis while mentioning your name in my biography. Even if there are numerous inter-crossed works, it is really interesting to become aware of the boundaries they are actually crossing…. PS: Where would you position the big categories: Hard Sf and Soft/Social/Sociological SF? Previous Previous post: Are We Becoming Cyborgs?